Could MannKind Corporation Be a Top Stock in 2015? MannKind headed into 2014 with high hopes but largely fizzled out in the second half of the year. Are the stars aligned for MannKind to have an exceptional year, or will it be more of the same for shareholders? It has been a wild ride for shareholders of biopharmaceutical company MannKind (NASDAQ:56400P706) in 2014, with the company at one point tripling in value from its 52-week low of $3.80 to a high of more than $11 per share. The stock had dropped back to less than $6 as of Friday. Yet despite the wild volatility, it looks as if one of Wall Street's most controversial biotech stocks is on pace to finish the year more or less in line with the S&P 500. MannKind shareholders were clearly looking for more, as this was to be a pivotal year for the company's lead product, Afrezza, an inhaled drug for type 1 and 2 diabetes patients. The Food and Drug Administration rejected Afrezza in 2011, citing the need for additional studies and more information regarding its delivery device. Three years later, Afrezza returned with fresh data and a redesigned dreamboat inhaler. In June, MannKind received its long-awaited approval, and Afrezza is scheduled to hit the market in the first quarter of 2015. But the process of developing Afrezza has come with a monstrous price. Based on MannKind's most recent quarterly results, the company sports an accumulated deficit of $2.46 billion. In other words, it has burned through a mountain of money over the past decade, and it remains to be seen if the company will ever recoup enough to offset this deficit. The big question now is whether MannKind could become a top stock in 2015. Let's look at both sides of the coin and then make the call. Convenience could be the No. 1 factor that sends MannKind's stock soaring in 2015. Type 1 and 2 diabetes are chronic conditions, and the prospect of taking insulin injections for the remainder of one's life might not be pleasant. Enter Afrezza, which is an inhaled compound that completely removes the need for needles. Diabetics might be more than willing to pay for the convenience of a pain-free inhaler. The market potential for diabetes drugs is enormous. According to the latest figures from the Centers for Disease Control and Prevention, 29.1 million people in the United States have diabetes (90%-95% of all cases are type 2 diabetes), with another 86 million in the pre-diabetes state. One or two drug developers likely don't have the capacity to treat all of these people, so Afrezza should have plenty of room to claim significant market share in 2015. Finally, MannKind has an experienced marketing partner in Sanofi (NASDAQ:SNY). Getting a drug approved is only half the battle for biopharmaceutical companies these days. The other battle is fought on the drug launch front in terms of pricing and marketing. Many high-potential drugs have sailed through the approval process only to fall flat on their face following launch, including GlaxoSmithKline's long-term COPD maintenance therapy Breo Ellipta and Denderon's metastatic castration-resistant prostate cancer immunotherapy Provenge. Having Sanofi in its corner should pay dividends for MannKind. On the other hand, MannKind will face a number of challenges in 2015 that could keep it from greatness. To begin with, no one really has any clue yet of how Afrezza will be priced, which will be a critical component in determining its success or failure. I figure an inhaled and more convenient treatment would be priced higher than traditional needle-based insulin therapies. However, if MannKind and Sanofi price Afrezza too far above the traditional diabetes therapies, it's possible few diabetics will make the switch and Afrezza's sales will suffer. Second, MannKind shareholders might be in for a bit of a shock when the first few quarters of revenue are reported. The two companies' deal calls for 65% of net revenue for Afrezza to go to Sanofi, leaving just 35% of a potential blockbuster drug's sales for MannKind. I'd suggest that the $150 million up-front cash payment from Sanofi and $175 million in fronted collaborative expenses might have blinded some MannKind investors to the fact that the sales ramp up could be slower than expected. I'm also curious to see how well Afrezza will sell considering its broad warning label. While approved by the FDA, Afrezza is not recommended for use in patients with asthma or COPD, or for patients who smoke. This could exclude in the neighborhood of 20% of the total U.S. adult population. 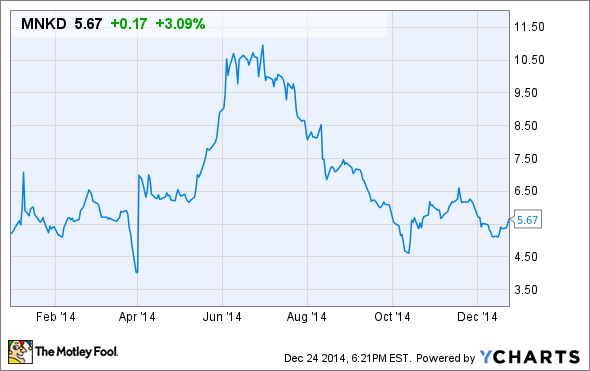 Could MannKind be a top stock in 2015? Now that we have a better idea of what MannKind is up against prior to its first-quarter launch of Afrezza, let's return to the original question: Could MannKind be a top stock in 2015? While I believe the company could see some early upside following the launch of Afrezza, I expect MannKind investors to be disappointed by receiving just 35% of net product sales. The reality of this smaller payment will likely reinforce my belief that MannKind has a relatively low chance of becoming profitable before 2017. This means years of ongoing losses for a company that has already racked up nearly $2.5 billion in cumulative losses. Pricing will be another key component. We just don't know how much Afrezza will cost, and that is going to make a huge difference in how well MannKind performs in 2015. Overall, I'm not looking for MannKind to be a top stock in 2015.